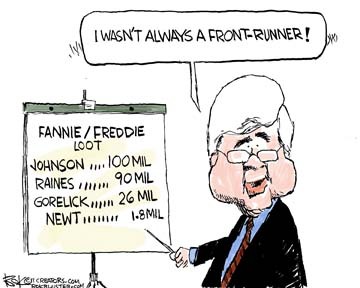 As surprise front-runner Newt Gingrich begins unpacking his baggage in Iowa the first item up for inspection is his $1.8 million dollar punched ticket on the Freddie Mac gravy train. The figures in the chart for Franklin Raines and James Johnson are from IBD. Gorelick’s $26 mil came from CNSnews. I love Newt, but I don’t think that he has ever had an unspoken thought!